This polish comes from See Sarah Swatch's etsy store Two Birds, One Store. I absolutely love Sarah's polish creations! She also made me Neptune's Pool which was dream polish idea I had. I was so thrilled when she opened up an etsy shop, because I knew she'd have some amazing creations....and she did! I picked up this one from her shop a little awhile ago. 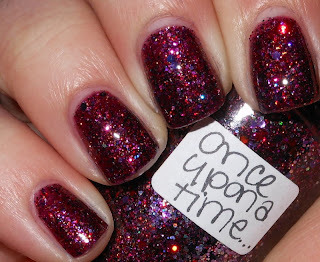 Once Upon a Time is a deep raspberry base with golden shimmer, small red, black, and purple glitter, and red, black, purple, and holographic hex glitter. Wow this is so pretty! Want! Oh so beautiful!!! I love her creations!!! This is GORGEOUS!!! Sarah's frankens are always amazeballs. Oh wow my best friend needs to see this. She would LOVE it! What a gorgeous glitter!! I love it!! This is so lovely! I will definitely be checking out her store. This is a very unique polish...I love it! This is such a cute and lovely color!